Ever tried this delicious Chinese pan-fried pork buns (韭菜豬肉餡餅)? 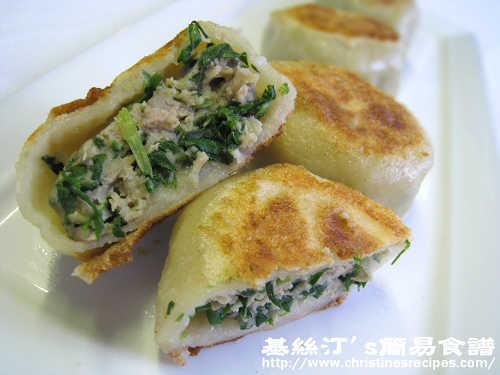 You might have known or even tried the famous and popular Chinese dumplings (餃子 jiaozi). Dumplings and buns are two different kinds of Chinese snacks anyway. 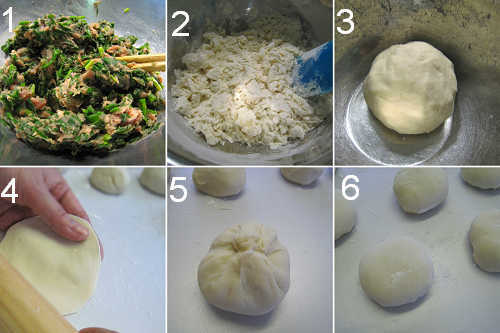 The pan-fried buns shown here are more or less like pan-fried dumplings (煎餃子 jian jiaoz) in taste, with totally different shape and texture. Well, the ingredients called for in this recipe are similar to making pan-fried dumplings. Even better, you don’t need to worry about the appearance of them whether they would look good or not, because it’s pretty easy to seal the buns. Best of all, you can wrap as much meat as you like for meat lovers who would really enjoy the juicy and succulent filling inside, yet with thinner wrapper outside. Rinse chives and briefly blanch in boiling water until just tender. Drain well and let cool. Squeeze water out of the chives and chopped into small pieces. Set aside. Add seasoning, minced garlic and chopped chives into minced pork. Blend all ingredients towards only one direction, either clockwise or anti-clockwise according to your preference, no turning backwards though. This method will ensure the pork stick together very well. Mix pork very well until elastic, about 15 minutes. Refrigerate for 30 minutes. The filling is done (see the picture 1 above). Sift flour into a big bowl. Add 6 tablespoons of 80C hot water into the flour. Use a spatula to mix well and create some little flour crumbs (see picture 2). Add 1 tablespoon of cold water at a time into the flour. Use hand to knead the dough until the surface is not sticky (see picture 3). Brush a bit of oil on the bottom of a bowl, place dough inside and covered with a damp towel. Let sit for 30 minutes. Turn the dough onto a lightly floured surface and knead a few times until smooth. Roll and stretch the dough out into a long strip, about 1 1/2 inches in thickness. Divide into 10 equal parts. Roll each part into a small ball. Lightly flatten with your palm and roll out into a thin, even round using a rolling pin. (see picture 4). Wrap a heaped teaspoon of filling in the center. Seal the edge (Trim excess dough on the seal if you like, it tastes and looks better then.) with the seal facing down. (see picture 5 & 6). Heat non-stick frying pan over medium heat. Add 2 tablespoons of oil. Place wrapped pork buns in a single layer without touching with each other. Fry them until both sides are light brown. Add 1/2 cup of boiling water, cover with a lid and cook until the water dries up. Done! Serve hot, accompanied with a zesty dipping sauce, combining soy sauce, vinegar and chili sauce. Note: If you'd like to trim the sealing, you can reuse the excess dough when you wrap the next bun. The last one would be a bit bigger of course. You have nine perfect buns, not too bad though. hi ^^ you are an absoloute genius! all the food i found here looks sod elicious and easy to make. the food that i thought wld be difficult to make is so easy! okay regarding this recipe, could i not add shaoxing wine? cos im not sure if we sell it here. Sure, you can replace Shaoxing wine with other white rice cooking wine. Hi christine!!! I lived in HK for 2years and was back to Australia, i missed the food alot in HK especially the street foods and yam cha... Do you have a recipe of the famous snack in HK...hot mini cakes or Pancake balls. I even bought the griddle to create it myself but i would really like to get that recipe which is crispy and soft in the inside. Pls. share me the secret to that!!! Love your recipes...cant wait to try them all! I love the mini pancake balls in HK as well. Unfortunately, I don't have the griddle at the moment. Where did you buy it? Was it from HK? oooohh - i love eating this bun -i am going to try and make this one next! i found the dough was really hard to work with, and the mince was really dry and hard to mix for the 15 mins you suggested. i'll have to try again! Hi Christine, I made this today and it was delicious! Thanks for sharing your recipe! Yes, all purpose will work. May I know beside chives, what other type vege I can use to replace it? Cos my kids dun like to eat chives. Or can I just put in minced pork only? Will the taste feel a bit dry? You can use many different kinds of vegetables, like chinese cabbage, baby bok choy etc. Have you read my recipe of steamed vegetable dumplings? I've used different kinds of veggies for making fillings, like mushrooms, corn kernels, celery and carrots. Just wrap any veggies you like. Hi! Thank you for sharing! I've just tried this and the dumpling skin is undercook in certain places. Why is that? I also find that resting the dumpling skin makes it even drier. :( I ended up adding 1 extra tbsp of water to make it smoother, softer and workable. My 2nd batch of skin I didn't rest it at all and it turned out fine. Why is that? The amount of water used to make dough will vary a bit, because of different brands of flour and under different weather. The absorption of water could be quite different from brands to brands of flour. Just try to get the right texture of the dough while you work all the way of kneading. If your dumpling skin was under cooked but the water in the pan had gone, you could simply add some more water and continue to cook until the dumplings are cooked through. I made these today and it was a success! My brother ate 6 1/2 of the buns! Thanks for the recipe! Sorry, not quite get what you mean by "top flour". I used plain flour / all-purpose flour. Top Flour is a low protein flour.. Better to check the ingredient labels on the packaging. Low protein flour contains protein between 7％ to 9％. made these tonight, turned out well, i will change the fillings as we love spicey and a bit of crunch. Is this pastry the same as the one used for Dim Sum in Australian milk bar/chip shops? Thanks for your love of this recipe. Sorry, no idea what pastry they use. They might use something else for commercial purpose. This recipe is for home cooks. I am planning on making this recipe and I was wondering if from your experiences, can this be made ahead of time? For example, can I refrigerate or freeze the bao after I have put it together? I know my mother-in-law used to buy bao like these frozen and we would fry them up and was wondering if we could do the same with this recipe. What is "cornflour"... is that the equivalent of cornstarch in the US? We call it cornflour, that's the same as cornstarch called in the US. This kind of dough is for pan-frying. And it's the traditional way of making this snack.